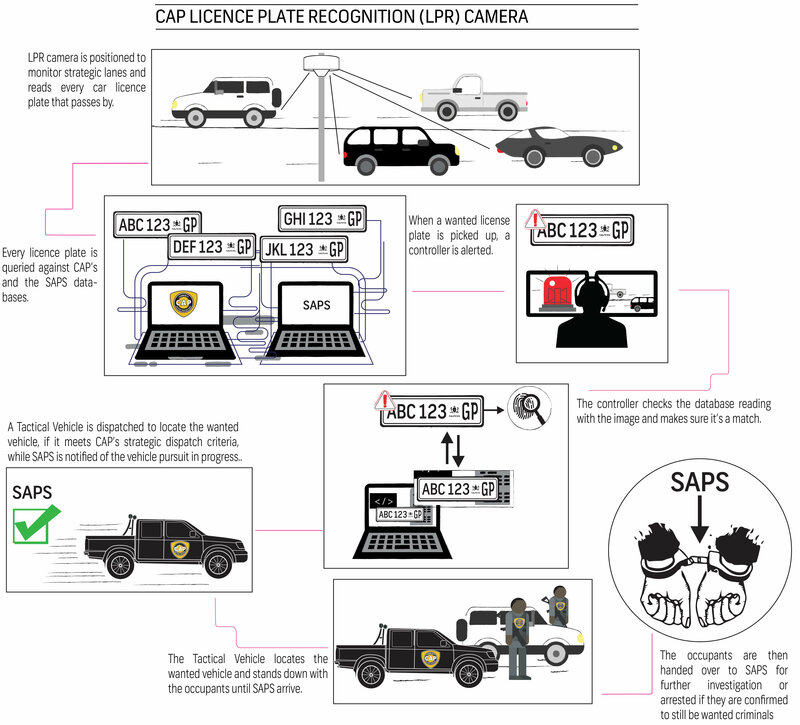 The initiative makes use of a Licence Plate Recognition (LPR) camera which is used to detect suspicious vehicles passing through strategic routes and an overview camera which records detailed footage of the environment. WHAT DOES IT MEAN FOR THE BRCF? The above image reflects CAP’s agreed on and multi-phase LPR strategy roll-out with the BRCF for the Bryanston / River Club area created during the annual community meeting in 2017. Phase 1 involves four active poles, each with an LPR and overview camera. The poles cover the entry and exit points within Bryanston CAP’s operational zone and have been funded from existing public space donations made by households and businesses within the BRCF area. In addition to the current set up, the service provider responsible for setting up the poles is in the process of setting up additional poles and has additional cameras should the need arise. As additional funding becomes available, Phase 2 will be implemented. Finally, Phase 3 (not shown above) includes cameras from the main arteries feeding the broader area (William Nicol Drive, Main Road and Rivonia Road) to ensure complete coverage of all traffic moving into/out of the area. In 2018 the trustees from River Club Downs, Riverside Lodge and Beechwood Cottages came together and decided to tackle the exposed perimeter wall they jointly share along Ballyclare Drive. Supported by the BRCF, the complexes agreed to fund the installation of highly advanced long-range thermal cameras along the boundary wallto detect potential intruders. The cameras use analytics to identify intruders and are actively monitored by CAP. Another great example of a few people getting together to make things happen! Privacy is an important component of the CAP CCTV programme. All footage is stored securely, in accordance with best practices around protection of information, and may only be accessed by SAPS as and when needed for a case. Footage will not be released without a valid case number. WANT MORE CAMERAS ON YOUR STREET? CAP recommends the use of CCTV cameras to replace street-guarding solutions, which have not proven to be effective in reducing crime. If you want to help fund the further phases of the LPR cameras around the suburb, you can do this simply through a recurring public space donation. Please contactinfo@capgroup.org.za to arrange this. Should individual streets wish to consider funding the installation and maintenance of CCTV cameras, this can be arranged. The costs for this will be calculated on a case by case basis. We would like to take this opportunity to thank those who have supported us by contributing towards the initiative. We are hopeful that this additional layer of security will help to further secure the suburb.